There are so many homeless veterans in the U.S. that a nationwide coalition has been established in Washington D.C. dedicated to address the issue: the National Coalition for Homeless Veterans. Coalition statistics, gathered through the U.S. Department of Veterans Affairs, indicate that about 11 percent of the overall adult homeless population are veterans. Most are single, live in urban areas and many suffer from mental illness, substance abuse or a combination of other disorders. Pinning down an actual figure of homeless veterans is difficult due to the nature of the situation. But the U.S. Department of Housing and Urban Development (HUD) does provide an estimate: around "40,056 veterans are homeless on any given night." That condition does not escape Woodburn and Marion County. 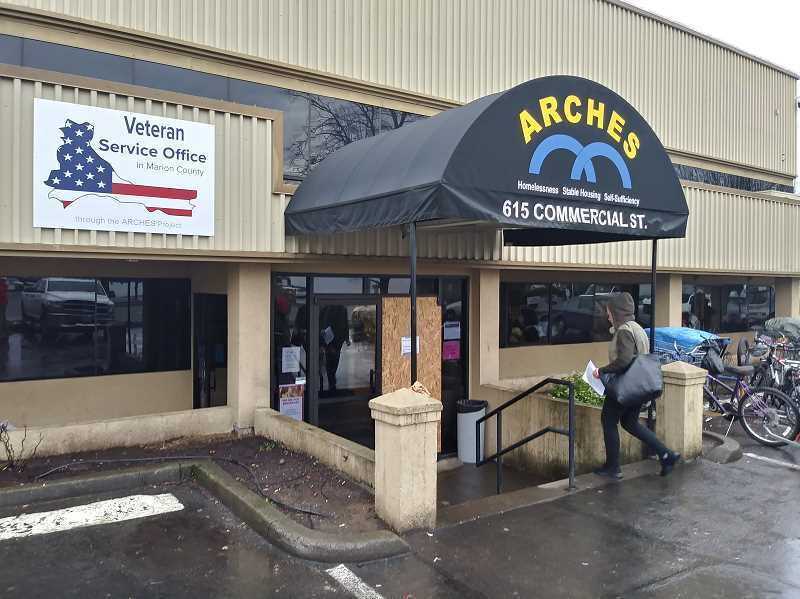 "At this time Mid-Willamette Valley Community Action Agency/ARCHES Project has a total of 157 veterans experiencing homelessness on the interest list for our housing assistance programs," said Linda Strike, ARCHES Project supervisor. "Of those, 59 meet the criteria for permanent supportive housing, most often due to severe and persistent mental illness. We have 79, previously homeless, veteran households enrolled in our veteran specific housing assistance programs." In an effort to address the problem, the Oregon Legislature mandated that counties establish Veterans Service Offices, and that process was achieved in Marion County when its Veteran Service Office opened on June 4, 2018. While VSOs are not restricted to homelessness, it is one of the many issues the county's office helps area veterans confront. 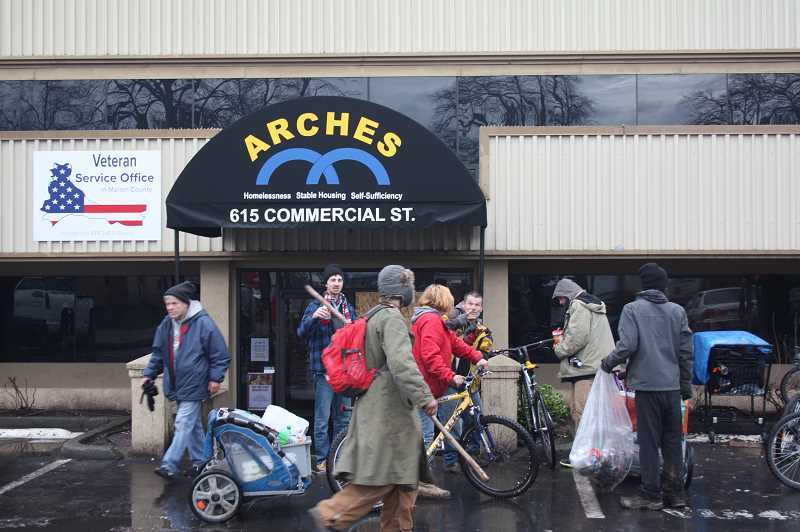 Marion County VSO is located in northeast Salem within the same building that houses the ARCHES Project, which is established to provide referral services to families who are either homeless or at risk of becoming homeless. Three VSO employees, Jim Chatman, James Riddle and Christopher Dyer, are swamped throughout their work day – and they wouldn't have it any other way. "We love what we do. For the three of us, this isn't a job, it's a passion to help our sisters and brothers-in-arms get the compensation they deserve for the service they've rendered to the nation," said Chatman, the county's lead veteran services officer. "Compensation and pension aren't freebies; they're the fulfillment of the contract by the U.S. government for the injuries, disabilities, and illnesses soldiers, Marines, sailors, coastguards (personnel), and airmen incur during their honorable service." Those duties are multifaceted: filing claims for compensation or pension; helping veterans get their military records; helping with burial and survivor benefits; directing veterans to other VA programs like education and health care. They have had an impact. "In the last quarter our VSO program conducted 231 interviews with veterans and/or veteran family members seeking benefits and recovered over $744,000 in benefits for veterans and their families," Strike noted. "Having the VSO office located at ARCHES has allowed for more comprehensive services for homeless veterans in our community. " Strike stressed that the quality of interaction between the VSO staff and veterans in need has effectively heightened the engagement of homeless veterans. "Through our ARCHES partners like SSVF (Supportive Services for Veteran Families) and Easterseals, we can also help with veteran homelessness, homeless prevention, housing, and employment," Chatman agreed. The Salem office is dedicated to Marion County veterans, and Chatman said they are eager to reach out to veterans around Woodburn and north Marion County. The VSO's roots reach back to 2005 when the Oregon Legislature mandated that each county have its own Veteran Service Office, although the physical office didn't officially open until last June. Marion County sources note there were 24,148 veterans living in Marion County in 2016. Resources for homeless veterans in the county have been handled through Supportive Services for Veteran Families, the Oregon Health Authority's veterans rental assistance program, and other programs. The addition of the county's VSO is intended to build on and extend those services. The local VSO crew is especially attuned to that task. "All three of us here are service-connected veterans. We know how the process works because we've been through it ourselves. We're here to help," Chatman said. "Our job is to help Marion County veterans file VA claims for compensation and pension. We act as the Veterans' intermediaries and representatives in their claims processes, assisting with information, guidance, counsel, filing, and appeal." The reward is in the results. "There are no words to describe what it's like to see the significant difference it can make to a veteran when they finally receive the benefits they deserve," Strike said. Location: 615 Commercial St. NE Salem, OR 97301. Hours: 8:30 a.m. to 4:30 p.m. Monday-Friday; closed between 12 p.m. and 1pm. Closed on holidays and some working Fridays. Walk-in vets for served for brief visits of 10 to 15-minute visits Wednesdays from 8:30 a.m. to 11 a.m. Phone: (971) 707-4400; Veterans Crisis Line, 1-800-273-8255. Bus Lines: Cherriot's No. 3, No. 17 and No. 20.